Leading Politbureau member of Frontline Socialist Party (FSP) Kumar Gunaratnam alias “Kumara Mahathaya” a.k.a. 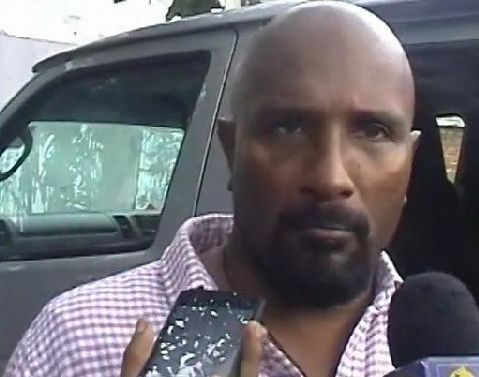 Noel Mudalige is very much in the news these days.There is much speculation that Kumar (whose full name is Premakumar Gunaratnam) who is currently in Sri Lanka on a month long tourist visa may not obtain an extension and may have to leave or be deported from the Island. Gunaratnam is currently a holder of an Australian passport bearing the name Noel Mudalige. The FSP leader who arrived in Sri Lanka a month ago has supposedly violated conditions of his tourist visa by actively engaging in politics during his stay here. Officials from the Immigration and Emigration Dept visited the “Peratugami Samajawadi Pakshaya” (Frontline Socialist Party) party headquarters at Pannipitiya on January 26th inquiring after Gunaratnam who was not in the premises at the time. Immigration Officials then told FSP officials to inform Gunaratnam to call over at the department within two days. Accordingly Gunaratnam accompanied by his lawyers and party comrades went to the Immigration dept on Jan 28th where he was questioned about his conduct in Sri Lanka as a “tourist”. He was requested to call over on the 29th also to enable officials to complete the recording of his statement. Thereafter he was asked to present himself at the Immigration dept for the third time on Jan 30th. The final outcome remained unkown at the time this article was being written. It may be recalled that Kumar Gunaratnam had to leave the country of his birth amidst controversial circumstances in April 2012. He had entered Sri Lanka legally under the name of Noel Mudalige and engaged in clandestine political work .Kumar was instrumental in forming a dissident group within the Janatha Vimukthi Peramuna(JVP) to which party he belonged then. 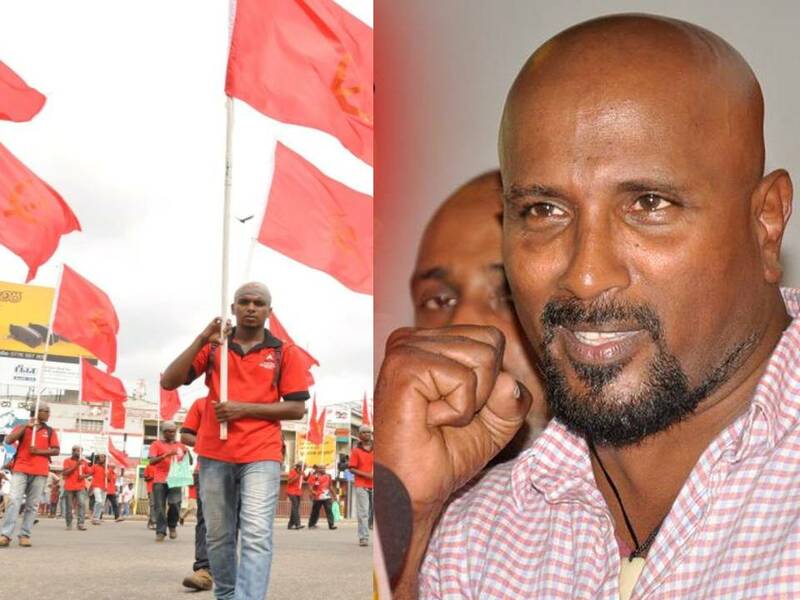 The breakaway faction was about to launch itself openly as the Frontline Socialist Party on April 9th 2012 when Kumar was abducted by state agents on April 6th along with FSP comrade Dimuthu Attygalle. A spontaneous call for his release was made from diverse circles such as family members, party comrades, media personnel,varsity academics and human rights activists. The emotional appeal made by his wife,sister and mother were very moving. Mrs. V Gunaratnam his mother who made her appeal in Sinhala,Tamil and English touched the hearts of many and personified the anguish of all Sri Lankan mothers whose children were reported “missing”. Subsequently their captors released both Kumar and Dimuthu. Their release would not have been possible without the commendable humanitarian efforts of the Australian High Commissioner Robyn Mudie, who went the extra mile in the matter. Once again International intervention was instrumental in upholding human rights in the island. After his release Kumar returned to Australia using the passport issued under the name Noel Mudalige.Australian High Commissioner Ms.Robyn Mudie was at Katunayake Airport to personally ensure his safe departure back.Kumar was not “officially” deported and was technically eligible to return to Sri Lanka if he paid the fine of Rs. 39,130 for overstaying.It was then felt that Colombo would not let him enter Sri Lanka again and engage in politics. Furthermore given his traumatic experience and close brush with death,it was doubted whether Kumar too would want to return to the land of his birth in the near future. This However was exactly what happened in the “miracle of Asia”! The man who escaped “death by Disappearance”by a hair’s breadth in Sri Lanka ,two and a half years ago arrived at the BIA, Katunayake on Jan 1st 2015 at 00.11 am from Australia via Singapore. He entered the country using the name Noel Mudalige and passport No 1016123 bearing the name Noel Mudalige.Apparently the outstanding fine of Rs.39,130 for overstaying had been paid on his behalf and now Kumar had a tourist visa to stay in the country till Jan 28. Addressing a press conference in Sri Lanka at the Lions Club Hall in Rajagiriya, Gunaratnam said that it was his intention to stay in the country and engage in politics to support FSP Presidential candidate, Duminda Nagamuwa. Kumar accused his former organization the JVP of having entered into a secret deal with common opposition candidate Maithripala Sirisena. He also denied that he himself had arrived at a hidden understanding with the Mahinda Rajapaksa Govt so as to visit Sri Lanka again. Gunaratnam said that the presidential election had provided some political space and opening which he as a ‘leftist’ had seized and utilised. Despite these denials it was widely suspected that the Rajapaksa Govt had facilitated Kumar Gunaratnam’s Sri Lankan visit so that he could embarrass the Sirisena camp through allegations of a secret deal with the JVP. This was akin to former President JR Jayawardene releasing Rohana Wijeweera and his comrades in 1977 with the ulterior motive of letting the JVP turn its wrath against Mrs.Bandaranaike and the SLFP. Now the polls are over and Maithripala Sirisena has triumphed. If the allegation of Gunaratnam’s visit being a machination of the Rajapaksa regime was indeed true then it can be expected that the guns of the new dispensation will be trained on the FSP leader.The current interest shown by the Immigration Department officials in Kumar Gunaratnam suggests exactly that. In any event the conditions of a tourist visa forbid any involvement in politics during one’s stay in the Island even if one was of Sri Lankan origin.By that yardstick Kumar Gunaratnam had violated his visa from the time he addressed a press conference. Whatever the fate likely to befall Premakumar Gunaratnam alias Kumar/Kumara Mahathaya a.k.a. Noel Mudalige the revolutionary antecedents of this colourful personality who was at one time a key leader of the JVP warrants interest. Though Kumar has broken ranks with the JVP and is now a FSP stalwart ,his significant contribution to the JVP over a period of nearly 30 years cannot be easily overlooked or dismissed lightly. The story of his life is indeed unique and worthy of narration. Having written extensively about him in the past , I shall rely on much of those writings to relate the tale of the man who fought a guerilla war against the Indian army under the nom de guerre “Gemunu” a quarter of a century ago. Premakumar and his elder brother Ranjithan Gunaratnam were in the vanguard of the JVP in the mid and late eighties of the 20th century. Ranjithan is no more but Kumar is active still and continues to make waves. During his days as a JVP activist Gunaratnam was known both as Kumar Mahathaya and Kumara Mahathaya. He preferred to call himself simply as Kumar or Kumara. 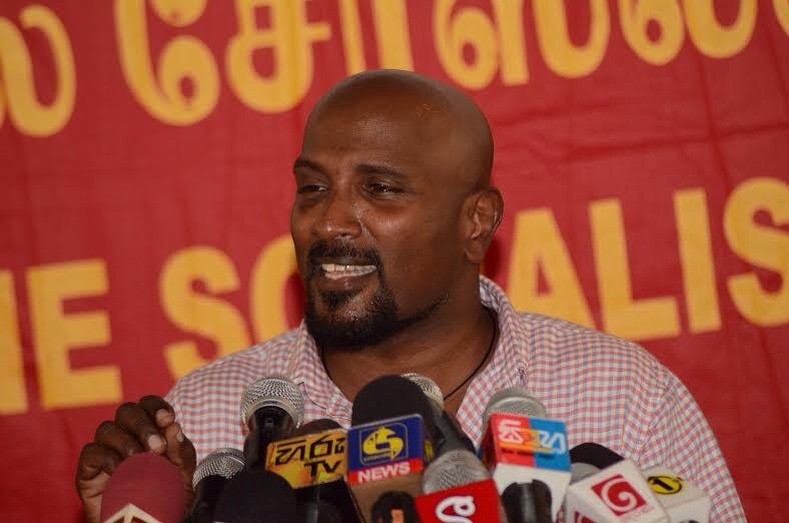 He has assumed a new identity now but continues to travel on the same path leading towards the goal of transforming Sri Lanka into a true Socialist state.The current controversy around him demonstrates that this 49 year old revolutionary socialist is someone whom his opponents and rivals are wary of. One reason for this may be due to his personality and past experience. Kumar Gunaratnam is not a just a theoretician or ideologue. He is a man of action. A doer and not merely a thinker. He possesses excellent organizational ability and has a knack of inspiring comrades to face overwhelming odds. He is not fond of platform oratory but excels in establishing rapport on a personal basis and converting others to his way of thinking through dialogue and discussion. Moreover Kumar is arguably the ablest military leader the JVP has ever produced. He led the JVP in a military campaign against the Indian Army in the Trincomalee District in 1989 until he was arrested. Some of the skirmishes in Trincomalee were successes from the JVP point of view. There is a widespread belief that the JVP campaign against “India” in 1987 -1990 was twisted in the sense that the “Rathu Sahodarayo” killed people in the South as perceived collaborators of the Indian “invasion” and urged boycotts of Indian products including “Mysore Parippu” and “Bombay Onions” but never ever took on the Indian army directly.The JVP is often mocked for this as cowards who could only kill unarmed people in the South while not daring to lift a finger against the armed Indian soldiers in the North and East.While this accusation is correct to a great extent, there was however a notable exception. This was in Trincomalee District where the JVP engaged in armed action against the Indian army and even drew blood in a few instances. The JVP’s anti –Indian military wing known as “Deshapremi Janatha Vyaparaya” (Patriotic People’s Movement) was commanded by “Keerthi Wijayabahu”. Its area leader for Trincomalee in 1989 was none other than Premakumar Gunaratnam, operating under the nom de guerre “Gemunu”. He was the man who led the JVP/DJV against the Indian army in the Trincomalee District. Under the leadership of Gemunu the DJV-JVP accomplished a few military strikes against the Indian Army but these incidents did not gain much publicity due to the concerted efforts of the Sri Lankan and Indian authorities in deliberately suppressing information. They did not want the JVP to gain publicity and political credit through these operations. Besides most incidents of that nature in Trincomalee were believed to have been committed by the Tigers then. There was also an opportunistic shift by the JVP and Indian authorities later. As the going got tough for the JVP at the hands of the Sri Lankan security forces, some among the crimson comrades struck a tactical deal with the Indians. This was similar to the understanding reached by the Liberation Tigers of Tamil Eelam (LTTE) with President Ranasinghe Premadasa when the Tigers were gasping for oxygen at the hands of the Indian Army. The JVP’s second insurrection came to an inglorious end in 1989/90.With Wijeweera and Gamanayake being killed , some of the remaining JVP members began escaping to India. In another Kautilyan exercise, Indian officials facilitated their travel. Somawansa Amerasinghe alias Siri Aiya allegedly used the Indian connection to reach Europe.Meanwhile Premakumar alias Gemunu was also arrested and detained. With that the JVP military campaign against the Indian army in Trincomalee ended. Despite this short lived campaign, tales of “Gemunu”s military successes spread among surviving JVP cadres and sympathizers. Premakumar acquired a heroic image among the residual JVP.This helped him gain a new status within the JVP later. Kumar Mahathaya’s cult status and heroic image among JVP members and his organizational ability and tactical skill made him a feared adversary in the eyes of his political “enemies”. His experience as a military field commander presented a potential threat. Gunaratnam devoted his time and energy along with the two Gunatilakes , Senadheera and Nandana,to resurrect and revive the JVP. Although he was junior to Somawansa Amerasinghe , Premakumar now referred to as Kumar/ Kumar Mahathaya or Kumara/Kumara Mahathaya became the dominant leader in the new JVP of the nineties. Very little was known about him outside the movement as he opted to adopt a low profile and function behind the scenes while letting people like Wimal Weerawansa hog the limelight. A noteworthy aspect of the JVP military campaign commanded by Premakumar alias Gemunu in Trincomalee was its non–terrorist nature. The attacks were essentially of a guerilla type and against military targets.Though the JVP engaged in mass scale terrorism in the south through its assassinations of civilians including politicians, administrators, media personnel and families of security forces, the operations against the Indian Army in Trincomalee cannot be classified as terrorist. I would like to focus now on the little known role of “Gemunu” during the Indian army period as well as some events leading to it.The objective is not to portray ‘Gemunu’ as a hero but to relate the tale of an important phase in the JVP’s history that is not much known. Although the mass media of the day have not publicized this phase, there is some important material available in books, monographs and research papers.Chief among them are the books “Sri Lanka: A lost Revolution (The inside story of the JVP) and “Indian Intervention in Sri Lanka” by Prof. Rohan Gunaratna. I have also contacted knowledgeable journalists, authors, academics, research scholars, security officials and above all, some ex -JVP members in gathering information about Kumar Gunaratnam. The Gunaratnam brothers were of mixed parentage with a Tamil father and a mother of Sinhala–Tamil mixture. The younger sister is Niranjana. The family lived in Anguruwella in the Kegalle District where the mother taught for 34 years at St. Mary’s Kegalle. The three children studied in the Sinhala medium and were fluent in Sinhala. They could understand and talk in Tamil but could not read or write.Both brothers entered the Peradeniya University Engineering faculty in different years. Both got immersed in JVP politics and as a result had to drop out from undergraduate studies at different times. Ranjithan later functioned as convenor of the JVP backed Inter-University Student Federation. He was much liked and respected. Ranjithan became a member of the 21 member JVP Central Committee and later the 7 member politburo. He was a personal favourite of JVP supremo Rohana Wijeweera. Ranjithan was the district secretary of the JVP for Kurunegala District. On one occasion he was sent to the multi–ethnic Trincomalee District by the JVP hierarchy. He set up a Trincomalee District committee of the JVP that functioned even during the time when the Indian Army was occupying the Northern and Eastern Provinces. Ranjithan was captured by the Sri Lankan security forces in January 1990. He was tortured and interrogated while in custody. Later he was summarily executed by a para-military death squad aligned to the state. His body was disposed of. Ranjithan Gunaratnam is classified among the “missing” still. He was born in 1960 and was 30 years old at the time of his death. Ranjithan’s “Thamby” Premakumar was born on November 18th 1965. He studied at St. Mary’s College, Kegalle from January 2nd 1971 to December 3rd 1980. He continued studying at Pinnawela Madhya Maha Vidyalaya from June 15th 1981 to March 22nd 1985. He became involved with the JVP in a limited manner at the age of 15 in 1981. His elder brother did not encourage him in this. Premakumar known generally as Kumara or Kumar entered Peradeniya University in 1985. He was admitted to the Engineering Faculty under student identity number E/85/58. His National ID Card No was 653231890V. When he entered University the JVP was a proscribed organization as President J.R. Jayewardene had banned left parties during the July 1983 anti-Tamil pogrom, without taking action against UNP leaders like Cyril Mathew. While Kumar had been associated with the JVP since 1981, he formally joined the organization only in 1985 after he entered Peradeniya. It is said that his brother Ranjithan was not in favour of his younger sibling getting involved in politics. He wanted the “malli” at least to graduate as an engineer instead of disrupting higher studies like himself. But Premakumar went ahead and joined the JVP through the recommendation of Sisira Kumar Devapriya, a fellow undergraduate.Initially he was engrossed in student activities in the University and held office in the JVP controlled student unions. He was a popular guy particularly among girls. Contemporaries say that he was involved with quite a few girls though he ultimately settled for a wife he met in campus as a medical undergraduate. The young man from Kegalle was a deep thinker, tactician and man of practical action. Faced with state repression the JVP was slowly beginning to strike back and engage in counter action. Forced to function clandestinely the party was urgently in need of arms and cash. It was against this backdrop that Kumar Gunaratnam had his baptism of fire. Interestingly it was on the auspicious Sinhala-Tamil new year day in 1987. A group of young JVP members consisting mainly of undergraduates or ex-undergrads assembled clandestinely at the Marrs Hall premises in the Peradeniya University. It was the night of April 14th 1987. Senior leaders of the JVP told them of the plan to be carried out. A former military man briefed them of the layout of the Army camp in Pallekelle.The JVP team was picked up by a van at 2am in the night. The cadres wore army uniforms. Kumara was appointed field commander of the group which included two women. They had only one shot gun and several knives of different sizes in their arsenal. The JVP had begun infiltrating low level personnel within the police and armed forces and there was an “insider” in the camp to help out. Thanks to this the JVP squad entered Pallekelle camp from a less conspicuous side. The guards taken by surprise were overpowered. The JVP made off with a sizeable cache of firearms and ammunition using a route along the river. The nation was rocked by the Pallekelle raid. An intensive manhunt was launched to apprehend the perpetrators. Most of those involved including Kumar went underground. But he was arrested within six weeks on May 23rd 1987 at Galagedara. He was taken to Galagedara Police station and then Kandy Police Station. After escaping Kumar established contact with the JVP hierarchy. It was while he was in custody that the Indo-Lanka Accord had been signed and the Indian Army deployed in the North and East. War had erupted between the Indian army and the Tigers. In the South the proscribed JVP was mounting a campaign against Indian occupation and unleashing a campaign of violence.In the changed situation Kumar was issued new directives by the JVP leadership. He was appointed secretary of the JVP District Committee in Trincomalee and elevated to the Central Committee. He was also assigned the nom de guerre “Gemunu” and instructed to conduct a military campaign against the Indian forces under the aegis of the “Deshapremi Janatha Vyaparaya”. Thus the younger brother took over the District Committee set up by the elder brother in Trinco. Trincomalee was the only district under Indian army control in which the JVP was functioning. It had about 15 to 20 cadres under the command of the committee. Kumar alias Gemunu was immediately made secretary of the committee and placed in overall charge. The committee comprised five persons, namely Gemunu, de Saram, Sanath, Arjuna and Pindeniya. One of the plus points for the JVP in Trincomalee was that it had acquired some arms in 1987 from the army camp in Kallar. The gradual takeover of the North and East by the Indian army was resented by some sections of the armed forces who began connecting with the JVP. When the garrison at Kallar was required to be downsized, some soldiers conspired with the JVP to “stage” an arms robbery. A pre-planned “JVP raid” took place on October 25th 1987 where a number of weapons were reportedly taken away by the JVP. While some were returned unofficially to some soldiers the rest were retained by the JVP.Thus when Gunaratnam alias Gemunu took up command in February 1989 the JVP had in its possession a small quantity of weapons like T-56, LMG, SMG, shotguns, mortars, grenades and explosives.Gemunu based himself in the Kantale/Kanthalai area and began a rapid campaign of recruitment and indoctrination. He concentrated only on the Sinhala residents of the area. Meanwhile the JVP had established links with the People’s Liberation Orgaqnization of Tamil Eelam (PLOTE) led by Umamaheswaran. This link up was greatly facilitated by the relationship between the JVP Secretary Upatissa Gamanayake and PLOTE military commander Manikkathasan. Both were sons of two sistersThe PLOTE however was not strong in Trincomalee and not in a position to help the JVP but Gemunu did interact with the Eelam Revolutionary Organization (EROS) that was well entrenched in Trincomalee. He avoided the pro-Indian TELO, EPRLF and ENDLF. Likewise he shunned the LTTE which he regarded as fascist and pro-western. Gunaratnam alias Gemunu did not want to enter even into a tactical alliance with the Tigers. Ironically the LTTE soon aligned with the Premadasa regime in May 1989 which helped the state to hunt down the JVP easily. According to information available Kumar Gunaratnam alias Gemunu recruited around 100 youths in two batches and conducted two week long educational classes for them. Of these about 20 – 25 were specially selected and given a rapid weapons training course for three days.Being explicitly instructed by the JVP hierarchy to confront the Indian army directly , “Gemunu” of the Deshapremi Janatha Vyaparaya began aiming at the Indian army convoys and vehicles as targets. He was lucky because an army deserter codenamed “Sarath Kule” teamed up with the JVP. He had quit the army after the Indian air drop of June 4th 1987. Sarath Kule had some training in explosives and could set up landmines. Since Kumar too had an engineering background the two together were able to engage in explosive attacks. The JVP high command had already instructed Gemunu that attacks on the Indian army should be launched in July to denote the second anniversary of the signing of the Indo-Lanka Accord on July 29th. The JVP picked the 93rd milepost area on the Kandy–Trincomalee road near Kantale/Kanthalai as the ideal location for a landmine attack. Initially a landmine was placed on the road but was detected by an Indian army mine–clearing foot patrol in the morning. The LTTE was suspected and not the JVP which was yet to make its mark.Kumar Gunaratnam alias Gemunu being a shrewd tactician made the unorthodox decision of placing landmines again in the evening in the same 93rd milepost vicinity. He calculated that the Indians would not expect a repetition on the same day in the same location. So Sarath Kule and Gemunu set up two landmines in close proximity. A JVP cadre was placed at a vantage point and tasked with the duty of watching out for Indian army trucks and signal that vehicles were approaching. Unlike the LTTE the JVP had no walkie-talkies.Unfortunately the JVP cadre assigned this duty developed cold feet at the last minute and ran away. So the leader Gemunu had to replace him. He saw an Indian army truck approaching and signalled to Sarath Kule. Then he ran back furtively to the target area. Instead of a convoy only a truck and jeep arrived. When the landmines were set off only one exploded and hit the truck. The jeep braked and then reversed rapidly. In the meantime an Indian army post had been set up on the other side of the milepost after detection of the landmine in the morning. That was not known to the JVP which had not conducted any reconnaissance or “recce”. Indian soldiers began running towards the scene of the explosion firing their weapons. The soldiers in the truck also started firing wildly and running. In the melee the JVP cadres led by Gemunu managed to retrieve an LMG and SMG and escape into the jungle without injury. It was after this attack that the Indian security forces realized that the JVP too was now confronting them directly. Some sections of the Sri Lankan security forces were excited by this development. Several security personnel began contacting the JVP, encouraging them to launch attacks against the Indian army and pledging clandestine cooperation.Accordingly Gemunu and Sarath Kule took the bold step of entering Trincomalee town and placing a landmine in the dockyard area. They were aided and abetted by Naval personnel. An Indian army truck was targeted but the landmine went off prematurely near the jetty. Both men escaped from the area with the help of sailors. With July 29th fast approaching the JVP under Gemunu wanted to make a decisive impact through a major attack. The opportunity came on July 25th 1989. On that day the JVP launched an ambush in Mullippothanai, a Tamil village to the west of Thambalakamam/Thambalagamuwa.An Indian army truck was hit by a JVP landmine. The JVP cadres then surrounded the vehicle, firing in the same mode as that of the LTTE. Fourteen Indian Jawans were killed and three injured. The JVP made off with the seized firearms. It was a big success for the JVP and sent alarm bells ringing in the corridors of power. What commander Gemunu of the JVP did not know then was that sections of the JVP through iniatives of the Indian espionage agency, Research and Analysis Wing (RAW) had set up a back channel of communication with Indian officials.The Deputy High Commissioner at the time, Nirupam Sen had encouraged such a liaison with the JVP and other Southern leftist entities. Sen was to be High Commissioner in Colombo years later. The Indian High Commissioner Jyotindra Nath Dixit dubbed as the viceroy of Sri Lanka, had himself re-organized the Colombo mission’s structure after the Indo–Lanka Accord.Two political secretaries had been appointed with Dr. S.Jaishankar, a Tamil Brahmin looking after the North and East and Gurjeet Singh, a Sikh overseeing the other seven provinces. First Secretary Joseph Thariyal, a Keralite Christian was the RAW point man at the Indian High Commission. Incidently Dr.Jaishankar is the new Indian Foreign secretary. The line of communication to some JVP elements was allegedly maintained by the trio of Nirupam Sen, Gurjeet Singh and Joseph Thariyal. When the JVP under Kumar Gunaratnam struck forcefully on July 25th, the Indian officials were shocked and angry.The JVP elements in contact with the Indians had to tender an apology for the incident to Nirupam Sen and promise that it would not happen again. An urgent message was sent to Gemunu to suspend attacks against the Indian army. A lull set in thereafter in JVP operations against the Indian Army. Gemunu was thoroughly disappointed at this turn of events but continued to strengthen the JVP in Trincomalee. He intensified recruitment and also began garnering more arms. He also embarked on a mission of interacting with and wooing disgruntled members of the security forces. It was on such a mission that he set forth on September 24th 1989. A meeting had been arranged with a soldier who had promised to give him a few firearms. But when Gemunu reached Palampottaru or Monkey Bridge he was arrested. He had walked into a trap which apparently had been devised by former Army Commander, General Sarath Fonseka, who was the commanding officer of the area at the time. Though in army custody, Kumar was treated kindly. Many army officers liked him and were sympathetic. Instead of placing him in a cell, the army kept him in the officers’ quarters in Kantale. He acted as a batman to a senior officer. 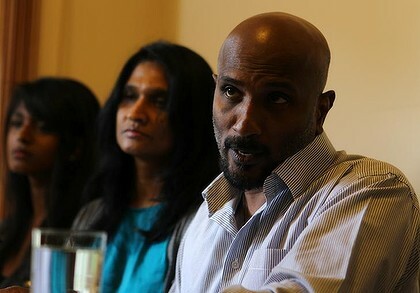 Kumar also advised the army officers on how to handle and treat arrested JVP suspects. He even liaised with them.After the Indian army left in 1990 March, war broke out with the LTTE in June 1990. Kumar Gunaratnam was transferred to Pallekelle , the place where he began his armed militancy. He was housed at the rehabilitation centre in Pallekelle. There are two versions about what happened thereafter. One version says Kumar was a model detenue at Pallekelle. After a period of rehabilitation he was released along with 15 others to be sent to Japan for employment. According to this version Kumar had dropped out from going to Japan and gone underground.The other version alleges that he escaped from Pallekelle under mysterious circumstances and went underground thereafter. According to this version he was assisted by security personnel to escape from Pallekelle. Gunaratnam known to JVP cadres as Kumara or Kumar Mahathaya, began to adopt a low profile in public while setting about quietly on a JVP renaissance mission. Together with senior JVP leaders he began to revive and re-organize the JVP. He succeeded in this to a great extent.In 1993 he got married to Dr. Champa Somaratne, a medical doctor attached to the Chest Hospital in Welisara. He reportedly used an alias to get married. After marriage Kumar lived at the medical officers’ quarters ar Welisara with his wife, whom he had met at Peradeniya University. She too was a JVP member and had contested elections in Kurunegala on the JVP ticket in 1994.Later his wife relocated to Australia and subsequently Kumar too joined her. It is said he adopted another alias to go to Australia and then again changed his name while there. Apparently he acquired a new passport and began travelling back to Sri Lanka frequently to engage in political work. Kumar maintained a low profile and operated under different names for personal security.“Noel Mudalige” also used his stay in Australia as a period of reflection and thought into the future of the JVP. He arrived at certain conclusions and succeeded in convincing the rank and file of the JVP into agreeing with him.He played an important role in mobilizing the “Jana Aragala Vyaparaya” (People’s Struggle Movement) that was the forerunner of the Frontline Socialist Party. Gunaratnam has been actively engaged in promoting his party on a worldwide basis among the Sri Lankan Diaspora. He embarked on a global tour late last year and spent some time in Canada too. His re-entry to Sri Lanka this year too was aimed at reving the flagging fortunes of the FSP.Men like Kumar who are wedded to their cause will not falter in their political journey however difficult the path is. The current tourist visa crisis notwithstanding,Sri Lanka will continue to hear of this son of the soil now transplanted down under. « Arvind Kejriwal Leads Aam Aadmi Party to Sweeping Victory in Delhi Assembly Elections.